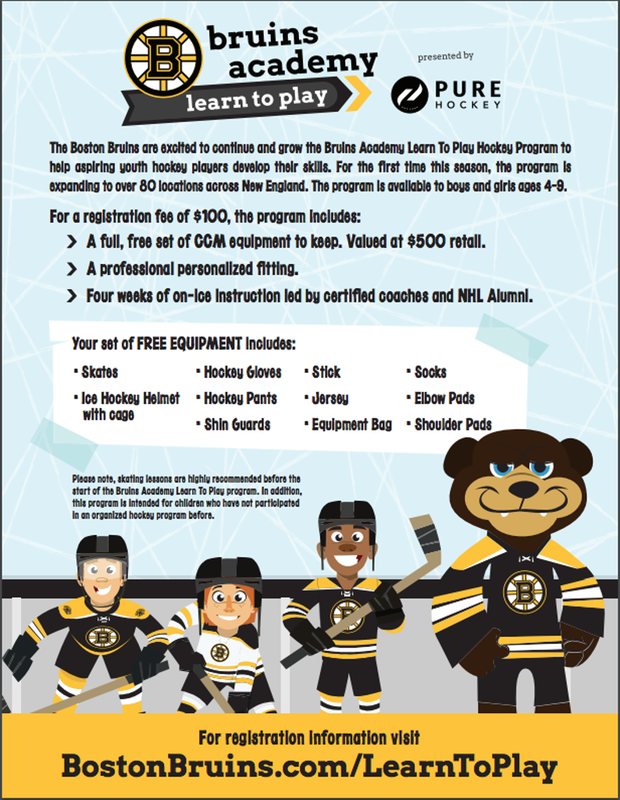 The Boston Bruins are excited to continue and grow the Bruins Academy Learn to Play presented by Pure Hockey (previously called "Little Bruins") to help aspiring, youth hockey players develop their skills. For the first time this season, the program is expanding to over 80 locations across New England and over 5,000 youth players will have the opportunity participate. The program is available to boys and girls ages 4-9. For a registration fee of $100, the program includes a full free set of CCM equipment to keep valued at $500 retail, which includes skates, a professional personalized fitting, and four weeks of on-ice instruction led by certified coaches. Equipment fittings will take place at the six stops of the 2018 Bruins Fan Fest Tour in August and at designated Pure Hockey locations in September. Following the fitting, the gear will be shipped and delivered to participants between August 23 and September 14. To see where the Learn to Play program will be hosted across Massachusetts and to register, click on this link. Registration opens Thursday, July 18 at 10 AM. First come, first serve. Slots fill up very fast.